Every two weeks, ATD Fourth World’s team in Dakar, Senegal conducts education activities with teenagers in the Grand-Yoff neighbourhood. Many of these teens live precariously, cramped in makeshift houses. 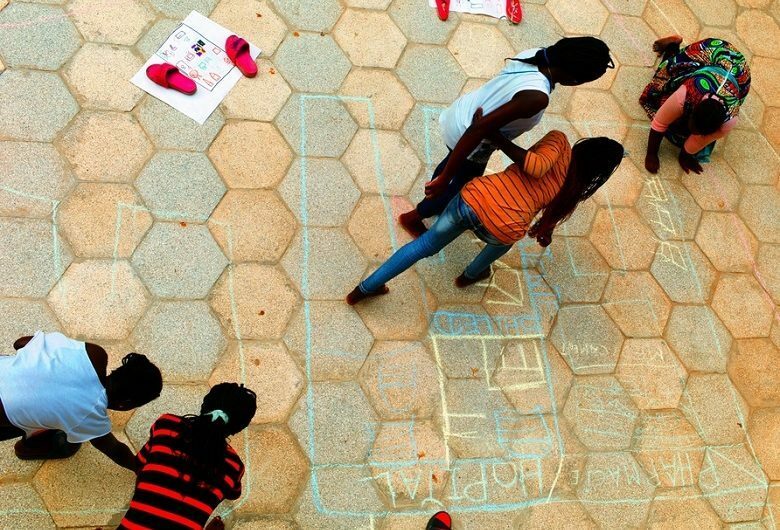 Since ATD Fourth World started its initiative, the teens have become able to do more challenging manual activities. They are also more willing to talk in depth about subjects they discuss together. Recently, the team moved the project location from the street to the courtyard of ATD’s regional satellite office in Liberty 4 because they wanted an environment that allowed more focus and effort. Together, they started a project related to human rights, the theme of this year’s World Day for Overcoming Poverty on October 17. Human rights are not an easy topic to talk about because the subject can seem pretty abstract. The ATD team approached the discussion with the goal of creating drawings and even a fresco to illustrate the adolescents’ ideas. What do you need to live well in society? What do you need at home to live well? 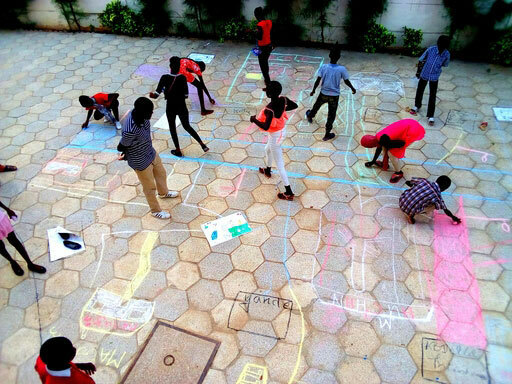 Feeling creative, the teenagers then drew an entire neighbourhood on the ground of the courtyard in which they placed their own dream home. They drew a hospital with a pharmacy next door, a mosque, and a church a bit farther down. The airport was located next to a police station. Roads were laid out for easy access to all the homes and various job locations. The teenagers had to talk together, listen to different ideas, negotiate, and make compromises. For example, the location of the pharmacy was at issue because one group wanted to place it in the residential area. Those involved with the hospital argued that the pharmacy had to be next door. Why? Because if you get a prescription while in hospital, you need it right away and you cannot run across town to get it. The church and the mosque illustrated the teenagers’ desire to support the faith of the neighbourhood’s inhabitants. They saw school as important so children could get a good education. As they finished up the rough draft of the neighbourhood, they were suddenly dismayed: “We forgot electricity and lamp posts!” they cried. On the whole, the activities took place in a spirit of solidarity, imagination, open-mindedness, togetherness, and friendship. 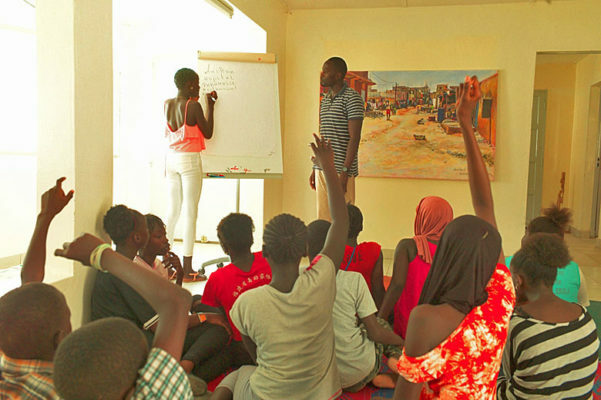 The teenagers accomplished a project on human rights in a quest for peace. They even considered including “bancs Diakhalé” [Diakhalé benches]. This is a Wolof expression meaning a public space for people who have problems providing for their families’ needs on a daily basis. Fathers with families will meet there to talk about their situation.